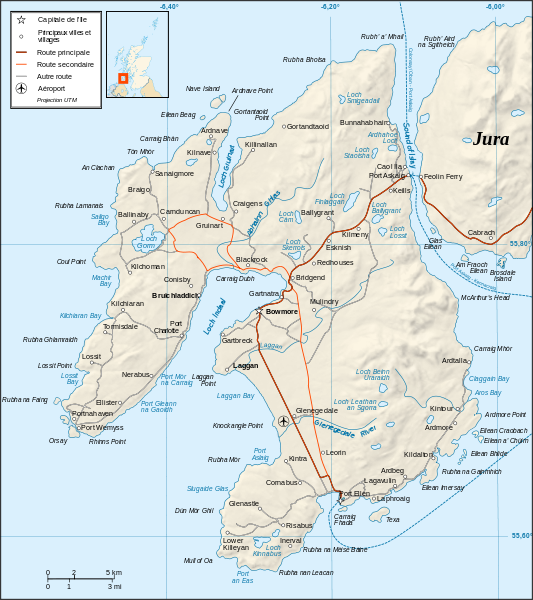 An early drive to pick up my cousin Phil in Dunlop started our first whisky trip to the islands of Islay & Jura. It was after a personal audience with ‘The Nose’ Richard Paterson Master Blender of Whyte & Mackay at his HQ in Dalmore House back in January that helped inspire our trip to Jura. His impassioned talk had stirred the mind. Considering we were both whisky fans who had been to many distilleries, we had not been to Islay. A recent catch up with childhood neighbours who holidayed near Bruichladdich also tempted our visit. Plans were made and Easter seemed the best time suiting both our work schedules. The weather forecast for that weekend was gloomy and we had decided to take mountain bikes to cycle the Islands. So the day came and the two and a half hour drive to the Ferry terminal at Kennacraig, just south of Tarbet in Argyll, was a pleasant one with little traffic problems. The terminal sits on an small island Eilean Ceann na Creige, which is reached by a single track road causeway. The large car park was our farewell to the car. Kit organised, tickets purchased at the cabin and we were off to the ferry. Calmac’s newest ferry, the MV Finlaggan and Polish built, swiftly took us out to the Sound of Jura. Confirming the bad weather forecast, we organised our kit and had some lunch and within two hours, we arrived at Port Askaig on Islay. The weather was what we Scots call dreich(overcast, dull, drizzly rain). Because there’s now no direct sailing to Jura, we had to then hop on a smaller ferry to cross the Sound of Islay. These narrow 800 metre straights have strong currents. Our first ferry arrived before midday and the smaller three car Jura ferry would leave half an hour after to coincide with travellers to Jura. 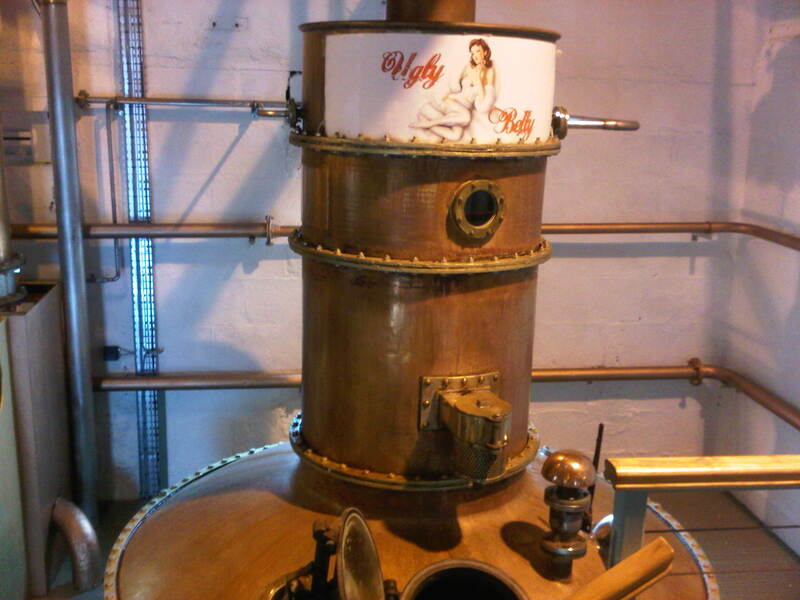 This had been pre-planned, to visit the Jura distillery that weekend, today’s 2pm tour was our only chance to see it. So, although only just arriving on Islay, we had to leave soon after. Crossing the Sound of Islay only took 15 minutes but the weather was deteriorating. Leaving the bikes with the cars, we heading into a small cabin with other passengers. After introducing our selves, we quickly made chat with an older bronzed couple. They explained their travels and were heading along the only road on Jura that passes the distillery. Back from a few months in the sun for a poetry festival on the island, they talked of tidal turbines that are due to put on these waters. With layers and jackets on and no possible view of the Paps of Jura, things looked more than a little dull. Asking what the cycle would be like to the distillery, his response was succinct, “Undulating,” he replied. But while on this short journey, the couple offered us a lift in their old Land Rover, on the condition they could start it! So after dismounting the ferry and leaving the jetty, we arrived on a misty and wet Jura. Heading off on our first cycle of the day, the 8 mile single track road to Craighouse. The name Jura translates to ‘deer island’ from ancient Nordic and we immediately found ourselves on a fairly remote landscape but too misty to see any deer. At first, the road hugged the coastline and was fairly flat. A reasonable start I thought considering the weather conditions. However, as we turned inland the road climbed up the misty, dark moorland and straight into the driving rain. Looking back occasionally towards the fading Islay and the hopeful possibility of a lift, the mist quickly engulfed us. Visibility was low but our spirits were high and we continued upwards. The wind was in our faces and were getting wet rather quickly. No photos taken in these conditions but strangely half way up a hill my cousins phone picked up reception, momentary contact to the outside world seemed bizarre. And then suddenly, a grumble from behind and the distant rumble of an old Land Rover came through the mist. I jumped to the side and shouted Phil who was a few metres ahead. Like an old rusty squeeze-box the 1960’s Land Rover workhorse shuddered to a halt. How happy we were to see it though. Our new friends helped us with our stuff and we piled in the back. Not even halfway to the distillery and we city boys welcomed the refuge. Still, it mean’t we would make the distillery tour in plenty of time. En route we heard more of the poetry festival as the rain leaked through the roof on to our seats. 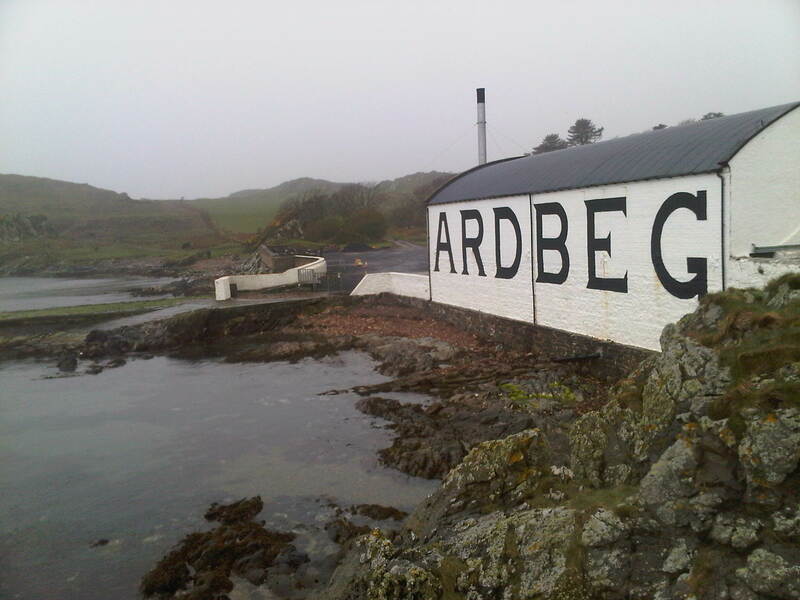 But it was not long before we arrived at Craighouse and Jura distillery. We were too early for the tour so we headed across the road the only hotel on the island, the Jura hotel. By now the rain had cleared by still many had taken refuge with the smell of damp clothes on the radiator. A welcome pint awaited but my bum was still too wet to sit down. It was not long before we joined a few other on the distillery tour. A new, modern shop/tasting area greeted us and we tried some of the Jura range. The newly launched Jura Elixir. It takes its name from the fresh local water, which the islanders call the ‘elixir of life’ and was believed to have been blessed by St. Columba in 560AD. Also we tried the Jura 16 year old and enjoyed them both. The Island would have made for a pleasant stay and I would happily to return to walk the Paps of Jura. It was now after 3pm and we had still a long way to go, our B&B booked for the night was back on Islay at Bruichladdich. So off on our bikes, we headed back up hill past the distillery buildings and out on to the moorland again. At first the skies seemed light but not long in and the elements became more exposed. The single track road undulated and the moorland breeze stiffened. It was a long cycle back without a lift this time. Our friend was right, the road was undulating and with every down hill came an uphill. 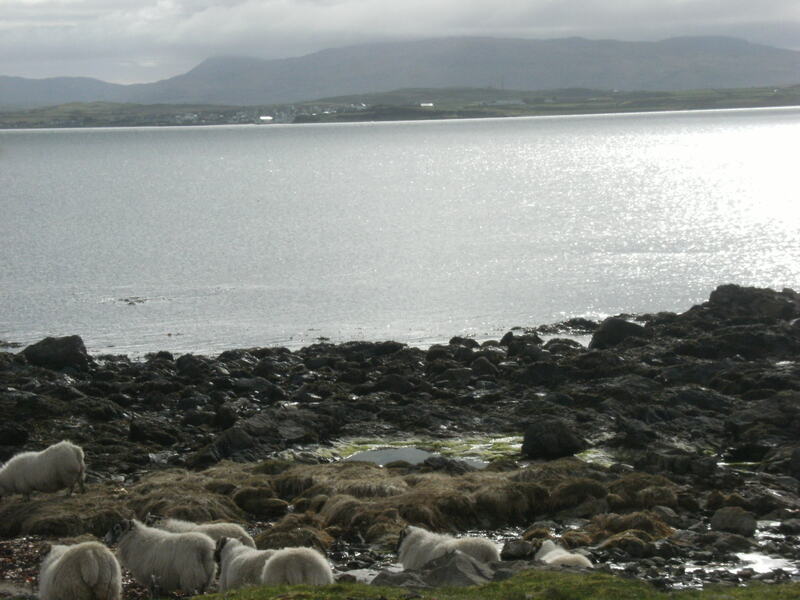 Eventually the sight of the Sound of Islay and we made it back to the ferry jetty a little beleaguered. A small Navy cruiser passed down the straights as approached the vacant jetty. Heading back over the sound of Islay we once again arrived at Port Askaig. It was now around 5.30pm and as we looked back towards Jura, the cloud lifted a couple of hundred feet but still not enough to see the Paps. Anyway, we had more to worry about, ahead was a 15 mile cycle to our overnight stay. A sharp half mile uphill straight from the port required me to walk. Legs a little weary from my first proper cycle in a long time. Although we planned our trip months in advance, the only area we didn’t organise was some training on bikes. So at the top we gingerly pushed the peddles on already saddle sore muscles. Passing tantalising signs for Caol ila and Bunnahabhain distilleries we carried on in straighter less undulating two-way roads. Although tired we pushed through the pain barrier, our dampish rucksacks felt heavy, pushing down our bike frames. The countryside was dry, clearer and the sky lightened. Our hearts lifted and we pushed on to Bridgend around 7pm. We turned right and along the coast of Loch Indaal with a renewed energy knowing our hilly landscape was now behind us. We could now see our destination some distance away and over the loch opposite. In the long loop our destination seemed stationary for a while as the sea breeze stiffened again. But we could see the sky darkening and we pushed on again. Islay’s popular destination for its bird life is near this part of the island, the sky and beaches were busy with many species. But our focus was the road ahead, in low gears and our heads down we finally made it to the settlements at Bruichladdich. Arriving our B&B the Anchorage, we stumbled off our bikes and congratulated ourselves, staggering into the quaint seaside cottage. It soon became apparent our adventure was not over for the night, the small matter of dinner for two weary travellers was necessary. It was quickly established that a trip to Port Charlotte would be required. We had half an hour to walk the one and a half miles to the village. Cycling wasn’t an option for our saddle sore bottoms. A brisk walk as the mist crept in low and darkened the sky. We made it just. The scaffold covered Port Charlotte Hotel was busy and only had a pricey la carte available. So quick jaunt to the Loch Indaal hotel to persuade the chef to cook on last meal. Luckily for us he was feeling charitable and a large steak & ale pie was washed down with a beer. 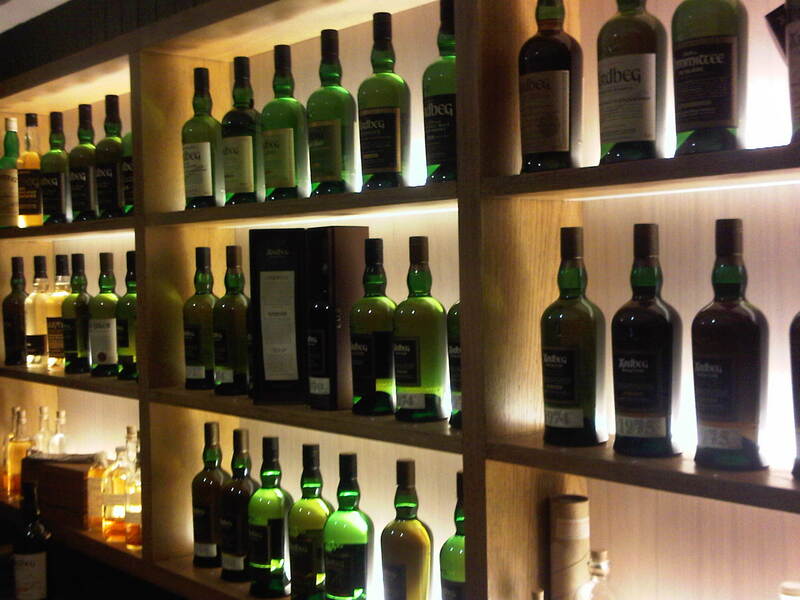 A few drams followed at the Port Charlotte hotel, where we met other cyclists and made plans for the following day. Our first day had been busy, exhausting but invigorating. Armed with distillery info, bus timetables weather forecasts we decided to cut down the cycling for the next day. Distillery tour times would decide our itinerary. It made sense to visit our nearest distillery first, Bruichladdich for the 10.30am tour and then head towards Port Ellen area for Ardbeg/Lagavulin/Laphroaig distilleries. The dark misty walk back to Bruichladdich was more relaxed and our aching limbs yearned for bed. The morning brought lighter skies and views across Loch Indaal to Islay’s capital Bowmore, directly across the bay. 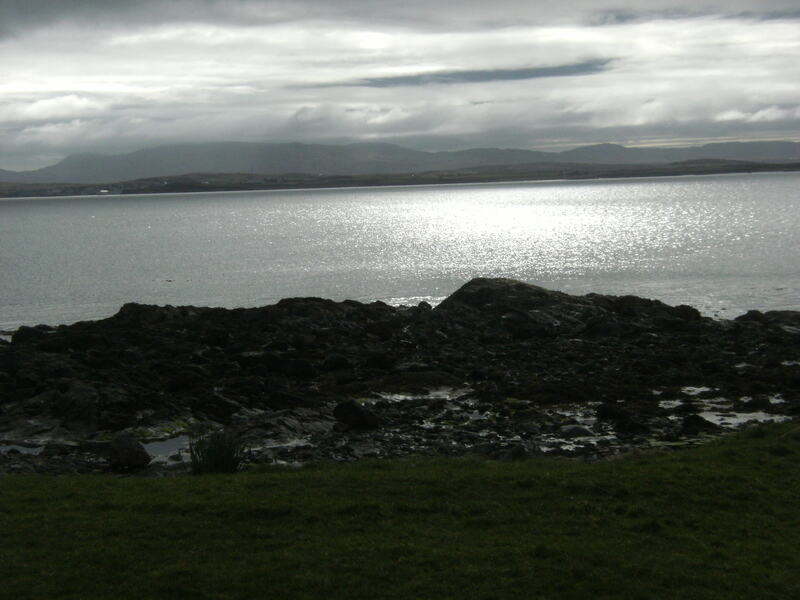 With Bruichladdich distillery only a couple of hundred yards away, we sat out enjoying the views after breakfast. Still we were working out how see as many distilleries as possible but it was obvious even at this early stage there would be problems to see more than about three. Set on cycling as a last resort, bus times were infrequent and didn’t link up with times in other villages. So we headed into Bruichladdich for the tour with a ‘play it by ear’ approach. A great distillery tour followed by an equally good tasting was thoroughly worth the trip. The bright aqua and blue with white washed buildings and in the village cottages itself, reminded me of the bright colours of Cyclades islands in the Greek islands. The sea loch, Indaal has aqua patches with light sands near the coastline making these bright colours appropriate for the the surrounding landscape. 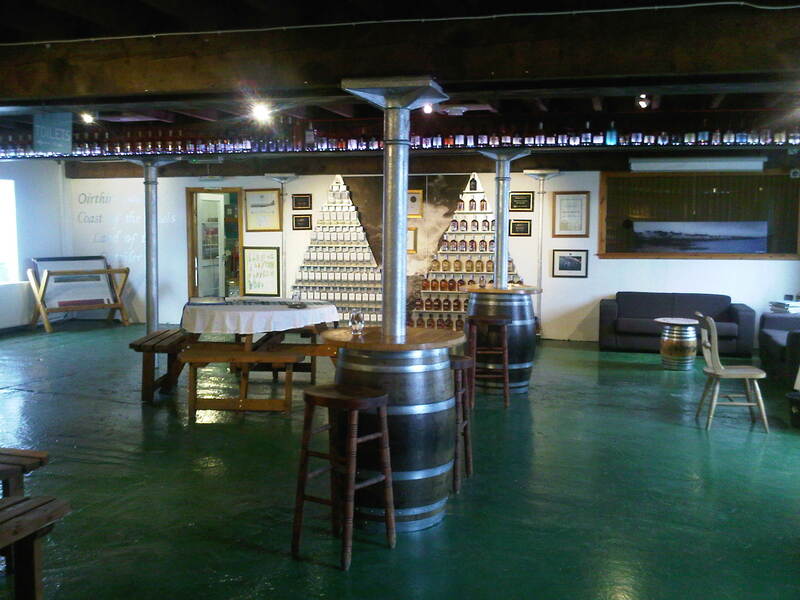 Built in 1881, the distillery fell into disrepair and was brought back to life in 2001. Since then it has focused on provenance, independence and innovation. It use the original ‘open’ 7-tonne mashtun, one of only a few left. 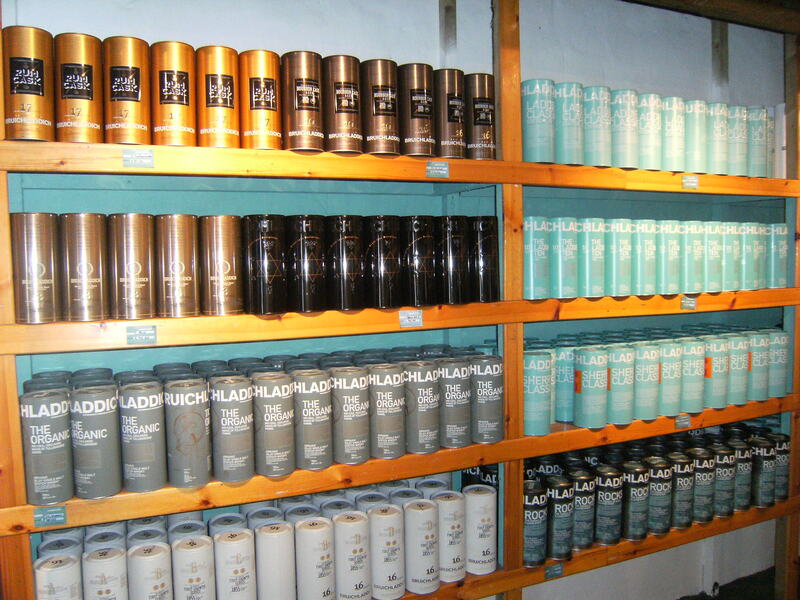 It makes four main brands: its core range Bruichladdich, Octomore, Port Charlotte and the Botanist Gin. The tour was good, informative and informal. Still morning, we tried The Botanist Gin, The Laddie Ten, the new Octomore Comus 4.2, Port Charlotte PC, Bruichladdich ‘The Sixteen’ Bourbon cask and the ‘bottle your own’ from the cask, since my cousin was buying. Some quite exceptional drams and fantastic shop with probably more variations of whisky than I had seen in any distillery I’ve been to. The only problem was we had to carry everything by bike! While I was busy nosing the whisky, my sharp-eyed cousin noticed a German couple arrive late. The guy had a BMW leather jacket which intrigued Phil. Popping his head outside he noticed new BMW 1M Series. This mean’t nothing to me but Phil is a keen car enthusiast. He quickly got chatting away as we left the shop into the car park and talked about the car. It was obvious Phil was impressed and to my great surprise, he boldly asked for a ride. It just so happens they were heading to Bowmore which was the direction we needed to go as well. Before I could open my mouth, we were jumping into the backseat and made a quick exit from Bruichladdich. The road disappeared fast as Phil chatted BMW spec’s with the Munich couple. Strapped into a sport seat I leaned forward to see us fly over bumps in excess of 100mph. Sheep and landscape flashed past and the force compelled me to sit back while I still felt the burning peat from the Octomore still in my mouth. Within 10 minutes we were thrown around the loch bay and had arrived in Bowmore, the main town of Islay. After a chat and farewells we walked away, still dazed from the experience. Although Bowmore distillery is right in the town centre, we were late for one tour and a long wait for another. We checked and the same applied for the infrequent bus service. So, although we had arrived very quickly and in style, we still had to hitch as advised by the tourist information. We walked up to the top of the high street as the drizzly rain started. Sticking our thumbs out, we smiled at passing traffic, still amusing at our adventures so far. It was not long before a car stopped and we jumped in the back. The rain now heavier, we were grateful to a friendly guy with his son who offered us a lift. Port Ellen direction was our plan and our driver obliged but asked exactly where we were going, to which we said Ardbeg. He duly obliged and insisted in dropping us off there. The journey was calmer but with poor visibility. We had a great chat about whisky and the driver talked about local Islay man Jim McEwan of Bruichladdich who had started out in Bowmore distillery. Passing through Port Ellen on a dull lunchtime, we went straight through, along a narrow coastal road. Arriving at the door, we couldn’t be happier. It was the furthest away of the Port Ellen distilleries and the weather wasn’t great. After thanking our kind locals we ran straight into the Ardbeg shop and Old Kiln Cafe. The next tour was an hour away, so we took a well needed lunch stop recommended by our lift driver. Mac & cheese was warmly welcomed and while waiting for our tour to start we took a walk around the grounds. There were many fine wine barrels like Côte-Rôtie outside and it made me start to think of this growing influence also in Bruichladdich and Jura. The beauty of going to Islay is seeing the different tours and trends in the whisky world represented by the big and smaller companies. The tour was good, maybe a little orderly but interesting to see such a cult brand and part of the LVMH group’s offering. The international visitors appreciated the mix of old and modern. At the tasting we chose Uigeadail, 2009 winner of World Whisky of the Year in Jim Murray’s Whisky Bible and the intriguingly named Alligator. This was explained as a heavy cask charring that looked like alligator skin. The result was a powerful peat monster but I preferred Uigeadail as an Ardbeg favourite. Interestingly only five or so key products, so different from Bruichladdich’s scores of finishes. It was now after 4pm and we were starting to get anxious about getting to another distillery and even back to our B&B some 20 miles away. So, off we went to the next, heading down the single track road towards Port Ellen. Cars passed as we walked and we wondered whether it would be too late now for any other visits. We knew Lagavulin was closer so we started a brisk walk. We both felt glad to have a rest day from cycling and enjoyed the whisky glow along the way, despite the drizzly rain and no view. 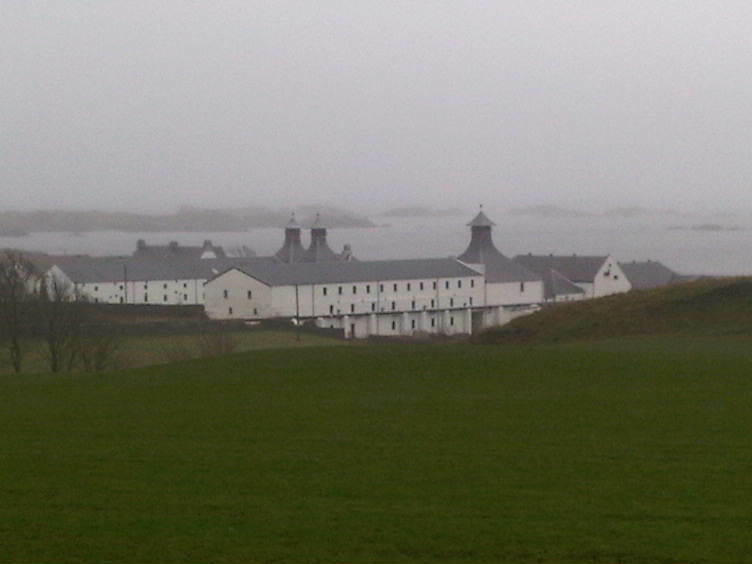 At around 15 mintues before closing we arrived at Lagavulin, one of two important Diageo distilleries on Islay. Unfortunately were too late for the tour but were welcomed in to have a dram or two. 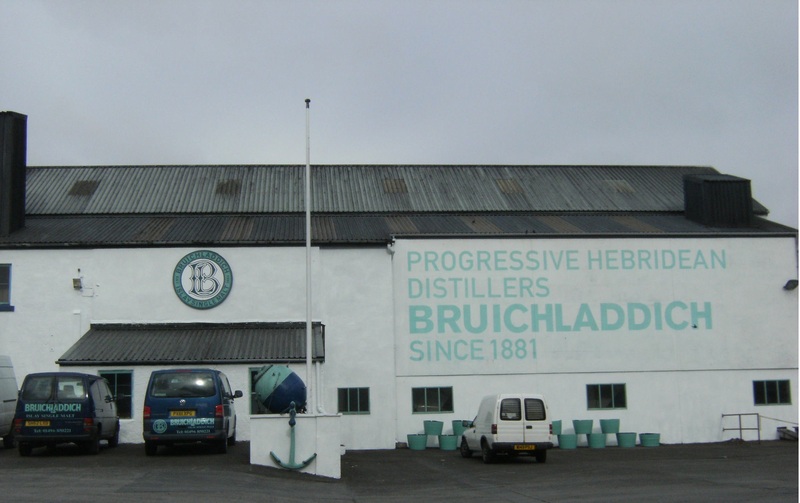 This owned by the biggest drinks company in the world is their flagship Islay malt with a good reputation, although allegedly operations are run by only one employee. Meeting a group just finished the tour we met in the lounge for tasting the multi-award winning Lagavulin 16 years, Lagavulin 12 years and Lagavulin Double Matured. We were also were given the Caol Ila 12 years. Leaving the distillery with others who had cycled, we started walking. Phil with hand out had managed to stop a car and this time it was a young local couple who drove us to Port Ellen. Our main focus was now trying to get back to Bruichladdich before dark. From Port Ellen in the south, we had calculated that the buses had finished so we headed through town thinking about hitching back. But a group of people sheltered at the bus stop and it was quickly established that there was a bus coming. We were delighted and got chatting to a couple of Irish guy’s from Cork. Whisky tourists but one worked for Cooley’s, we chatted and swapped stories. They had been to a big tasting tour of Laphroaig. 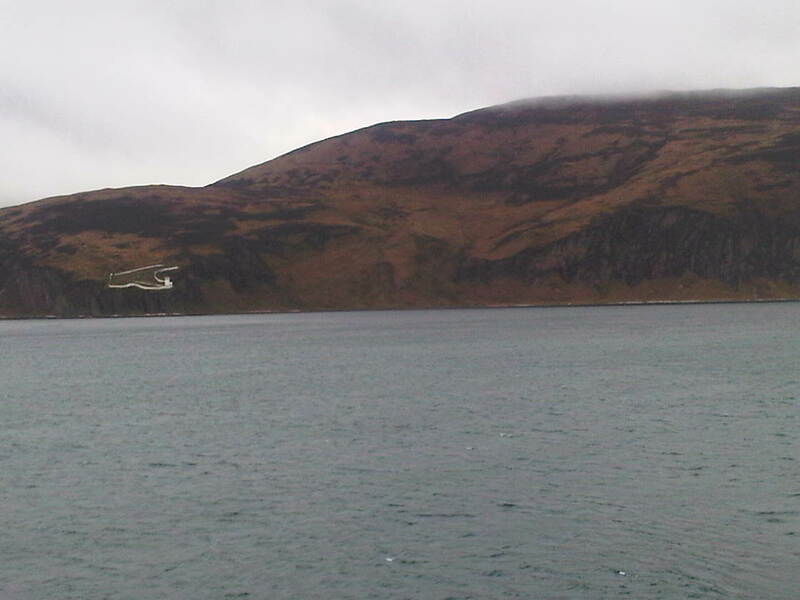 We were soon passed Bowmore and being dropped off at Bridgend. So only a few miles from home we hitched again just after the road junction. Again we did not wait long and were picked up by locals, two women this time. Again we received a warm welcome and they offered to take us to Port Charlotte, saving us the walk for dinner. We gladly accepted and happy to arrive in plenty of time for the 8.30ish dinner cut off time in Port Charlotte. After dinner at Port Charlotte Hotel, it was off to the bar to meet friends from the previous night for a few favourite drams from the trip. We shared a taxi home before a nightcap and bed. Before coming to Islay, I had been reasonable well-travelled to west coast Scottish islands but I found a renewed sense of hospitality here. The local people we met were a fantastic advert for the place, as a city boy I was quite humbled. There are strong links here to mainland Glasgow and everyone seems to know what everyone’s up to. I also was not really a peaty whisky fan but was won over by some quite incredible drams. My palate has finally well in truly taken to the peat monsters of this island. We cheered to a fantastic trip and longed for longer time here. The small matter of cycling back to Port Askaig for our ferry in the morning. A fine cooked breakfast set us up for the 13 or so miles cycle ahead. The weather was reasonable calm and overcast which can mean’t good for us. The long tour round Loch Indaal had a strong breeze for a cross wind and at parts made it harder than it should have been. Passing a rocky outcrop in the water, I had read about in my guide-book ‘Peak Smoke and Spirit’ by Andrew Jefford, this was the tragic sight of Islay’s worst World War 2 disaster. On 24th January 1943, a seaplane of international crew crash landed in bad weather at Blackrock on Loch Indaal. On escaping the scene, it was realised someone was missing, so eight men ran back to save the rear gunner. At that point depth charges aboard exploded and all nine men died. This horrific event was seen and heard from Bowmore across the bay and beyond. As we got to the Bridgend junction, a renewed strength in the peddling returned and we pushed on. Our ferry was leaving in just under an hour, so we were going to be fine. Still no views of the Jura Paps and the ferry traffic along the road increased. It stayed dry and we could take our time at the last stretch before the steep descent to the ferry terminal. Passing the signs again for Caol ila and Bunnahabhain made me think of the very fine Bunnahabhain 25 year old we had at my whisky night the year before. Freewheeling into Port Askaig was terrific and we went straight onto the ferry with fifteen minutes to spare. Once on we saw many French, Spanish, German, Asian and English tourists from distillery tours on the island. What a terrific trip. On the ferry back to Kennacraig we talked about our trip. Always entrepreneurial, we contemplated the islanders chat about not having fresh bread on the island. With the co-op having part-baked offerings and there being no bakery for 3200 people, any bread comes by ferry and is a day old by the time it get there. A business plan sparks in my head….. The enduring whisky memory for me was not the obvious heavy peat influence but the current trend for fine wine casks being used, creating beautifully balanced drams. I think people may look back at this time as the fine wine finish era. Jura Elixir, Jura 16 year old. The Botanist Gin, The Laddie Ten, Octomore Comus 4.2, Port Charlotte PC, Bruichladdich ‘The Sixteen’ Bourbon cask. Lagavulin 16 years, Lagavulin 12 years, Lagavulin Double Matured, Caol Ila 12 years. Thanks to my cousin Phil for top company and his wife Lyn for letting him go!